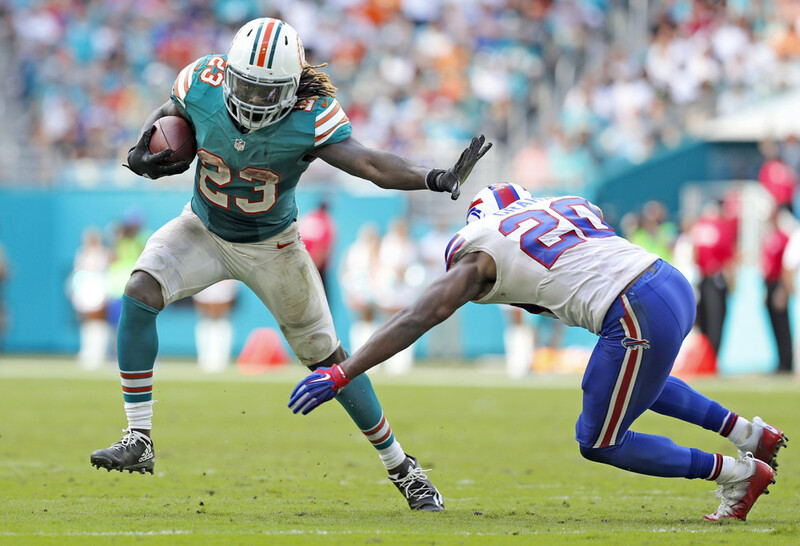 Will Jay Ajayi return first round value? Entering the 2016 season, Jay Ajayi was slated to be the starting running back after the departure of Lamar Miller. The hype around Ajayi died when Arian Foster signed with the Dolphins and the longtime fantasy darling rose up draft boards. He had a rocky start to the year, as he didn’t even make the Week 1 trip to Seattle, but when Foster went down, Jay Ajayi broke out. Jay Ajayi made it known that he can give you top three production from the running back position. Ajayi rushed for 200 yards in back-to-back games in Weeks 6 and 7. There have only been three other running backs to accomplish what Ajayi did in those two games. He also rushed for 200 yards in Week 15 as well. He had his down games as well; after being named the starter, he had five games under 60 yards rushing. Despite this, he put up top end production, rushing for 1272 yards and eight touchdowns in only 12 games as the starter. 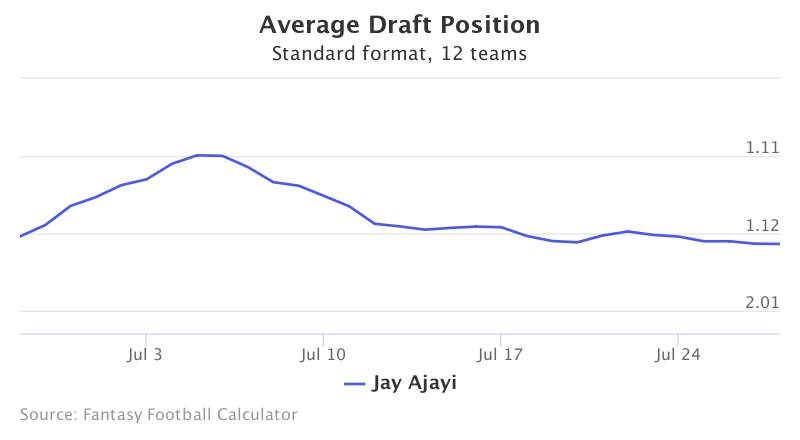 Jay Ajayi is currently going as a fringe first round pick in standard drafts in 12 team leagues. His ADP is below. The Miami Dolphins began the year 1-3 when Adam Gase went with Arian Foster, and then a committee once Foster went down. In Week 5, he stopped the running back carousel and stuck with Jay Ajayi as the main ball carrier. Ajayi rewarded Gase and the Dolphins handsomely, as he carried the team from that point on. Once Ajayi was named the starter, the team went to a run-oriented offense and won nine of eleven games. The Dolphins coaching staff and beat writers in Miami have praised Ajayi on his development this offseason, especially as a pass-catcher. If he increases his pass-catching prowess, it won’t be a surprise to see Ajayi touch the ball 300 times next season. It is understandable to justify not taking Jay Ajayi in the first round. He had a large part of his fantasy production come in four games and disappointed in too many games to become a bona fide stud. He also came into the NFL with knee problems and his future injury risk is quite high. However, volume is king in fantasy football. He touched the ball at least 19 times last year in 10 of the 12 games he started for Miami. If Jay Ajayi plays all 16 games, he will be in the top five for touches. That cannot be said for guys going around him like Jordan Howard and Devonta Freeman. Adam Gase is one of the brightest offensive minds in football and Ajayi appears to be his ace in the hole. The Dolphins star has a great chance to improve on last year and return value as the 7th running back taken.